Embed the Albany Movement montage into your Web site or blog by copying the following text and pasting it into your page's HTML code. If you do not know how to do this, speak to your site administrator or appropriate technical support. 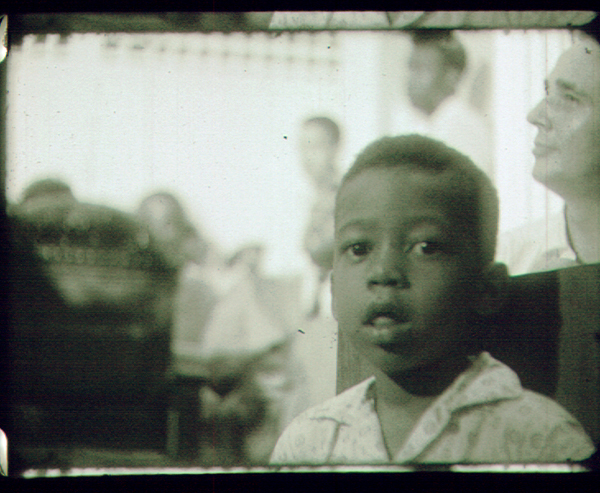 These images are captured from Civil Rights Digital Library moving image newsfilm clips for use in print or Web-based publications. Links to high-resolution images (300 dpi, for professional print usage) and low-resolution images (72 dpi, for Web and email usage) are included for your convenience. In this silent WSB newsfilm clip from 1962, African American women in Albany, Georgia, are arrested for picketing in front of Albany City Hall and nearby Lane Drugs. The clip begins with African American women marching in front of city hall in with signs whose slogans include: "Freedom to speak--enforce the 1st amendment," "Freedom of speech for Negroes too?" and "Freedom to pray, speak, assemble, picket, NOW!" White reporters and bystanders observe the protesters; Albany police chief Laurie Pritchett directs the women towards the building while another officer seizes their signs. The women enter city hall followed by Pritchett, the officer, and another man who has been taking notes. 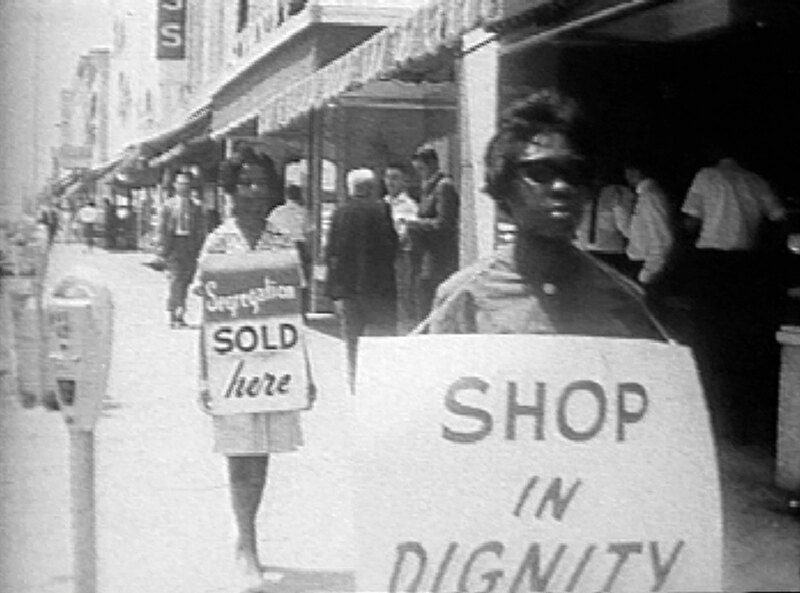 Finally, two women are seen in front of Lane Drugs with signs that read "Shop in dignity" and "Segregation sold here." The clip ends with police directing women into a paddy wagon and locking the doors. Civil rights demonstrators in Albany were often arrested for offenses such as failure to obey an officer, disorderly conduct, blocking the sidewalk, and obstructing traffic. 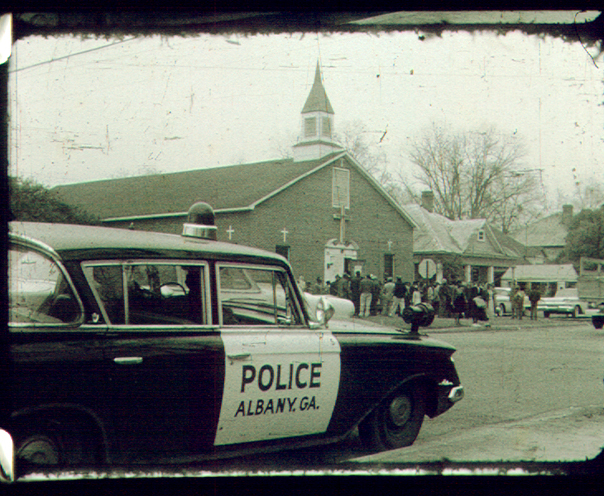 This silent WSB newsfilm clip from December 1961 in Albany, Georgia, includes shots of a mass meeting in Shiloh Baptist Church; groups of African Americans entering city hall; Albany mayor Asa D. Kelley and police chief Laurie Pritchett each speaking to reporters from their offices; Georgia National Guardsmen gathering at the local armory building; and African American students in the Trailways bus station. The clip begins with police cars driving past Shiloh Baptist Church as groups of African Americans wait outside. 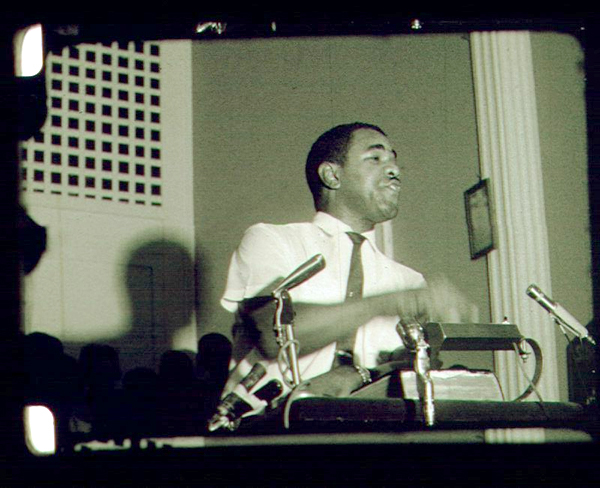 Inside the meeting, movement activists sing and clap their hands with the crowd while a woman (possibly Goldie Jackson, Albany Movement corresponding secretary) and later an unidentified man sing from the pulpit; a young man (possibly Student Nonviolent Coordinating Committee (SNCC) member Charles Jones) also addresses the congregation. Interspersed with the scenes from Shiloh Baptist Church are shots of African American men and women entering Albany City Hall, often watched by white onlookers, presumably to represent Albany Movement concerns or supporters who may be in jail. They include Jones and attorneys Donald Hollowell and C. B. King. Also in the clip, Mayor Kelley speaks to reporters from his office. Next, footage of the Georgia National Guard Armory, identified by signs on and beside the building, precedes filmed segments that show white guardsmen in uniform exiting parked cars and entering the building; they listen to instructions from a man at a blackboard and collect their supplies from the Company B supply room. A man in a helmet holding a rifle stands guard outside the building. On Thursday, December 14, concerned with the increasingly frequent demonstrations, arrests, and the threat of violence, Mayor Kelley requested that Georgia Governor Ernest Vandiver send the Georgia National Guard to help restore order in Albany if needed. City and state officials ultimately cooperated to avoid violence and the threat of federal government intervention in Albany. Also in the clip, reporters and cameramen film African American students, probably from nearby Albany State College, Monroe High School, and Carver Junior High School, in the Trailways waiting room; the students buy tickets, read newspapers, and wait at tables in the bus station's dining area. Other African Americans stand in clusters outside the station (including Jones, Hollowell, and C. B. King) and speak to reporters. Next, Chief Pritchett speaks to Norma Anderson, active demonstrator and wife of Dr. William G. Anderson, who is standing with a group of African Americans in Freedom Alley, a dead-end road beside city hall where demonstrators waited for processing after being arrested. Several students from the bus station watch Chief Pritchett and Mrs. Anderson as they speak. Later, police speak to a white man outside, then lead students from the bus station and help them into the paddy wagon as crowds watch. Finally, Chief Pritchett, back in his office, answers reporters' questions. Earlier in 1961, the federal Interstate Commerce Commission (ICC) ruled segregation illegal on interstate buses and trains, and in stations that serviced interstate travelers. Several protests in Albany were directed at the bus station to test Albany's compliance with the ICC ruling which went into effect November 1. During one of those protests on Thursday, December 14, the Trailways terminal restaurant served ten black patrons before it was closed; Albany police then arrested them, allegedly for their own protection. City officials professed compliance with the ICC ruling, but continued to arrest activists for spurious offenses such as failure to obey an officer, disorderly conduct, blocking the sidewalk, and obstructing traffic. 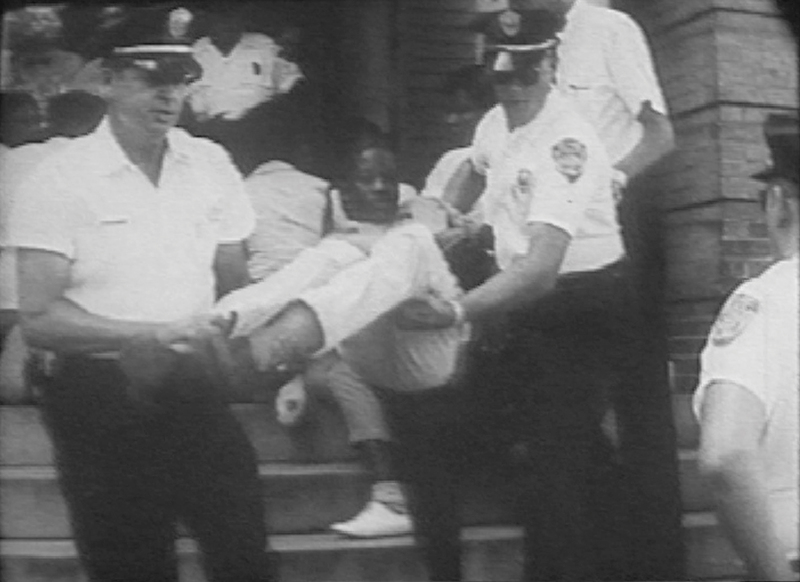 In this WSB newsfilm clip, African American student protesters kneel on the steps of the Albany Carnegie Library and sing the freedom song "Ain't gonna let nobody turn me 'round," as they are arrested by Albany police, Thursday, August 2, 1962. Students had been active in protesting segregation with the Albany Movement since the arrival of Student Nonviolent Coordinating Committee (SNCC) members Charles Sherrod and Cordell Reagon in August, 1961. While the Albany Movement leaders had repeatedly requested that the Albany City Commissioners begin dialog with them about concerns of the African American community, the commission refused to compromise. After the Interstate Commerce Commission (ICC) desegregation rule went into effect desegregating bus and train service stations, students began actively testing public facilities, protesting segregation. Albany Police Chief Laurie Pritchett, aware of the negative effects of images of police violence on peaceful protesters, instructed Albany officers to respond nonviolently to protesters. In this segment, officers carry limp demonstrators away from the library steps. In response to desegregation efforts, the Albany Carnegie Library closed in 1962. The desegregated library reopened a year later, but did not have any chairs. In this mostly silent WSB newsfilm clip from July 1962, demonstrators leave Shiloh Baptist Church, march through Albany's Harlem neighborhood, and are arrested when they reach downtown; Dr. Martin Luther King, Jr., Dr. William G. Anderson, Rev. Ralph Abernathy, and Albany police chief Laurie Pritchett speak at mass meetings at Mt. Zion and Shiloh Baptist Churches; and King and Abernathy speak at a press conference after their July 12 release from jail. The clip is divided into two segments. The first segment, which lasts about nine minutes, begins with silent images of mass meetings at Shiloh Baptist Church led by Wyatt Walker, then the executive director of the Southern Christian Leadership Conference (SCLC), interspersed with footage of a march through Harlem led by Albany minister Reverend Robert Alfred and SCLC minister Reverend C. K. Steele of Florida. Some of the demonstrators wear black armbands to protest King's and Abernathy's July 10th conviction for "parading without a permit." The protesters are flanked by Albany police as they march through downtown and are eventually arrested. They are led into Freedom Alley, where they sing while they wait. The series of images from the march is followed by silent footage of King speaking at a mass meeting at Shiloh Baptist Church. 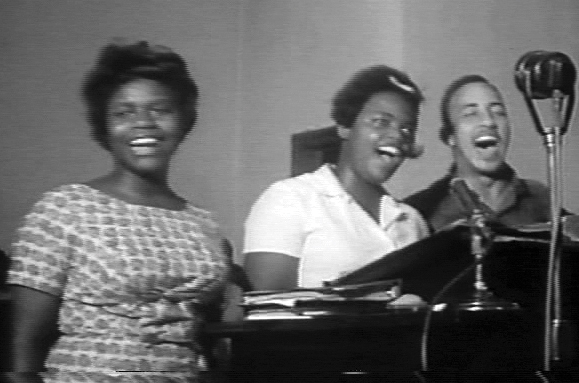 During the meeting, the Freedom Singers sing. King's remarks are followed by speeches by Dr. William G. Anderson and Rev. Ralph Abernathy. Slater King and an unidentified African American man briefly converse with police chief Laurie Pritchett before he addresses the congregation about the rock-throwing incident the previous evening, July 10. Pritchett's remarks are followed by an additional silent segment of King speaking. Among the men seated or standing on the dais are Charles Jones and Dr. William Anderson. Next, at a July 12 press conference in Shiloh Baptist Church, King and Abernathy pledge to stay in Albany until charges are dropped against all who were arrested in December for civil rights protests. King expresses his frustration at his early release from jail. He states that he does not "appreciate the subtle and conniving tactics used to get us [King and Abernathy] out of jail." On July 10, Albany Judge A. N. Durden had ordered King and Abernathy to spend forty-five days in prison or pay a $178 fine for parading without a permit on December 16, 1961; both chose to go to jail rather than pay the fine. King and Abernathy were released from prison July 12 when their fine was reportedly paid by an unidentified stranger. Wyatt Walker is seen sitting behind the two men. More scenes of the march in Albany and of Freedom Alley follow. The second segment of the clip, which is about eight minutes long, returns to the press conference at Shiloh Baptist Church where King and Abernathy are again seen expressing their frustration at their early release from prison. There are also more scenes from the mass meeting where Slater King and Albany police chief Laurie Pritchett speak to the audience. Clip Description: (Date: 1962 August 01). 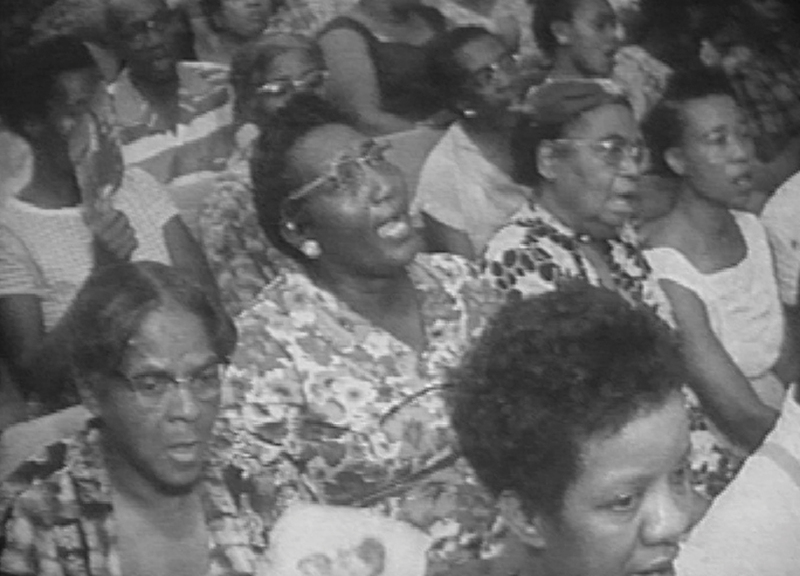 In this WSB newsfilm clip, an unidentified white female civil rights worker speaks to a mass meeting at Mt. Zion Baptist Church, August 1, 1962, and describes the challenges she has faced in rural southwest Georgia near Albany. These include acts of harassment, such as turning off her phone and destroying her borrowed-car. She also mentions that local African Americans were intimidated by the sheriff, and that black farmers were threatened with eviction by white landowners for associating with civil rights workers. Also included are scenes of a group of protesters praying outside and being led into City Hall by police officers, as well as the participants of a mass meeting, possibly at Shiloh Baptist Church, singing the freedom song, "Keep Your Eyes on the Prize." Clip Description: (Date: 1962 July). In this WSB newsfilm clip, silent scenes show examples of Albany Movement programs in 1962 including marches, direct actions, mass meetings, and press conferences; sound scenes include crowds at a mass meeting singing and listening to Dr. Martin Luther King, Jr., Albany attorney C. B. King, and Albany Movement president Dr. William G. Anderson. Other civil rights leaders in the clip are Ralph D. Abernathy, Charles Jones, and Andrew Young. During a night march, Albany police and state patrolmen surround demonstrators as they walk downtown. Albany police chief Laurie Pritchett speaks to the press from his office. C. B. King tells the crowd in Mt. Zion Baptist Church that movement leaders had submitted an appeal to the federal courts in which they complained about the mayor, city commission, and city manager, and asked that segregation be done away with in public facilities. Also in Mt. Zion, Anderson comments on the events of July 24, 1962, when chief federal appellate court judge Elbert P. Tuttle reversed the temporary restraining order against demonstration. Dr. Martin Luther King, Jr. expresses his disappointment of the injunction blocking demonstrations issued by federal district judge J. Robert Elliott and his gratitude for the reversal of that injunction by Judge Tuttle. He calls the audience to present their bodies as a significant witness by continuing to move and work for freedom and the crowd sings "Everybody Wants Freedom."